The issue of salt is one of the most contentious topics in nutrition today. Major government agencies have recommended salt restriction for years, yet strong push back by scientists and researchers, especially recently, has led many to question the validity of such a stance. The main factor causing salt to be portrayed as “bad” is due to the link between salt intake and higher blood pressure. Research conducted by Lewis K. Dahl, inspired in part by Dr. Walter Kempner’s “Rice diet”, is credited with the scientific acceptance of the theory that eating salt causes one’s blood pressure to rise. Since high blood pressure is a risk factor for cardiovascular disease, it has been thought that restricting salt would help prevent the occurrence of things like strokes and heart attacks. Of course nutrition is rarely so simple. The TONE trial (1,2), a small randomized study, found that sodium restriction led to a lower number of cardiovascular events in older people with high blood pressure. 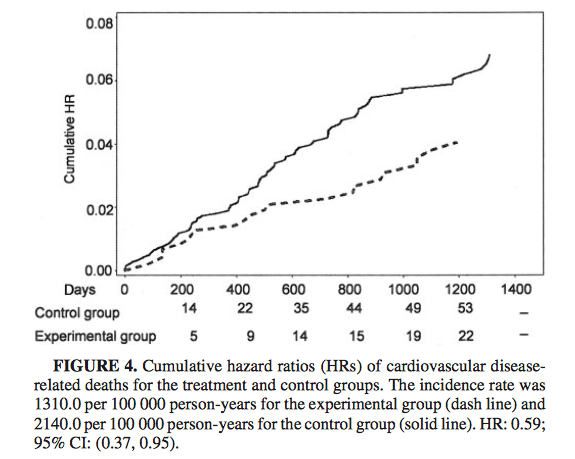 In follow up the salt restricted group had a (albeit non significant) reduction in death and death from cardiovascular disease. However, salt restriction did little for cardiovascular events like heart attack, stroke, and heart failure. Furthermore, the salt restricted group was consuming more vitamin B2, vitamin B1, calcium, and monounsaturated fat, which could have confounded matters by giving the salt restricted group an advantage. The lack of a statistically significant reduction in death (total or cardiovascular) should also establish the TONE trial as weak evidence of the dangers of salt. However this study doesn’t reflect true salt restriction. Since potassium chloride replaced half the salt in the sodium restricted group, this study may have been confounded by possible benefits of potassium and by avoiding possible risks of reducing chloride. This study is better evidence of the effects of replacing NaCl with KCl. So while it these trials suggest restricting salt has benefits, salt restriction might also pose risks to cardiovascular disease. A randomized, controlled trial in Italy was carried out to see if a salt restricted diet could benefit people with congestive heart failure (5). The results weren’t pretty: the salt restricted diet led to more hospitalizations for heart failure and subjects in this group died more than the group not restricting their salt. Rates of death were more than 150% higher in the salt restricted group, a statistically significant result. Worth noting however is that the subjects in the study were taking the loop diuretic furosemide which depletes the body of electrolytes like sodium and chloride, the constituents of salt. This type of drug is fairly commonly prescribed (especially for things like edema). Thus, most heart failure patients may not be very indicative of the common population. Looking further into possible risks shows that while salt restriction shows it may bring about a (often small) decrease in blood pressure (7), it may also raise LDL (7) and triglycerides (8), both risk factor for heart disease, though the observed increase in LDL and triglycerides in salt restriction trials is both inconsistent (18) and/or small. Low salt diets have been shown in randomized, controlled trials results in an increase in insulin resistance, regardless of prior insulin sensitivity or blood pressure (9-17). Insulin resistance is a risk factor for diseases like type 2 diabetes, cancer, and heart disease. However, no one would disagree that salt provides two essential minerals, sodium and chloride. A deficiency of these minerals undoubtedly causes problems, this is hardly under debate. Nearly every study cited to link low salt to insulin resistance involved sodium intakes well below the oft considered “adequate intake” of 1500 mg of sodium. Although two studies found increased insulin resistance in sodium restricted diets above this level (13,17), both were not much higher than this (about 1700 mg sodium/day). Most Americans consume well above the RDA of 2300 mg of sodium a day. Perhaps public health officials are right to focus on reducing sodium intake since this seemingly offers the greater health benefit in a population based context. The truth about whether salt is a dietary villain or an unfairly maligned mineral probably falls somewhere in the between. I think people get to hung up declaring things like salt either good or evil, healthy or unhealthy, angelic or demonic, black or white, cats or dogs (wait, what?). But it’s highly possible there is a middle ground. Retinol, also known as vitamin A, causes disease when both not enough or too much of it is consumed. The same is true of many minerals, like iron, which causes serious health problems when not enough and too much of it is consumed. Even water can kill if you get too much or not enough. The healthiest intake for these nutrients is somewhere in between two extremes. Salt may be the same. Seen above: Risk of cardiovascular disease by excretion of sodium (left) and potassium (right). The higher the line, the higher risk of cardiovascular disease at that levels of excretion. Notice the sodium graph is a J-shaped curve. Okay, it’s a pretty weird looking J but whatever. This is not the first time such a finding has been reported (20). Such a J curve probably explains why studies on salt show such variability; while some observational studies have found salt intake to be associated with cardiovascular disease (23), others have found salt to be protective against cardiovascular disease (21,22). This is simply observational evidence, prone to problems, but it fits a hypothesis which is also consistent with the clinical trials discussed in this chapter. Insulin resistance seems to be enhanced at levels as high as about 1750 mg of sodium per day which interestingly was the level shown to increase death in the heart failure study discussed earlier. This suggests to me that a sodium level at or below 1700 mg can bring about unhealthy physiological changes. Alternatively, the TOHP studies suggest that lowering salt intake from 3600 to about 2600 mg per day may be beneficial to cardiovascular disease. 2600 mg of sodium per day was also roughly the amount taken by the subject in the heart failure study who died less. This means two studies found 2600 mg was more beneficial than a sodium intake about 900 mg less or more. Although future research may elucidate this more adequately, I believe a dietary intake of around 2600 mg of sodium (give or take about 500 mg) is close to the healthiest intake, accepting of course that specific factors may make this amount, either higher or lower. Exercise, for example, dramatically increases sodium loss meaning working out increases a person’s salt needs (24). However, specific numbers are less important (and more likely inaccurate) than the general concept. The salt debate shouldn’t be about whether people should restrict salt, but about what level of salt intake will bring about the greatest benefit to health. 4. Cook NR, Cutler JA, Obarzanek E, Buring JE, Rexrode KM, Kumanyika SK, Appel LJ, Whelton PK. Long term effects of dietary sodium reduction on cardiovascular disease outcomes: observational follow-up of the trials of hypertension prevention (TOHP). BMJ. 2007 Apr 28;334(7599):885-8. Epub 2007 Apr 20. 9. Petrie JR, Morris AD, Minamisawa K, Hilditch TE, Elliott HL, Small M, McConnell J. Dietary sodium restriction impairs insulin sensitivity in non insulin-dependent diabetes mellitus. J Clin Endocrinol Metab. 1998 May;83(5): 1552-7. PubMed PMID: 9589654. 23. Yang Q, Liu T, Kuklina EV, Flanders WD, Hong Y, Gillespie C, Chang MH, Gwinn M, Dowling N, Khoury MJ, Hu FB. Sodium and potassium intake and mortality among US adults: prospective data from the Third National Health and Nutrition Examination Survey. Arch Intern Med. 2011 Jul 11;171(13):1183-91. doi: 10.1001/archinternmed.2011.257 24. Rosner MH. Exercise-associated hyponatremia. Phys Sportsmed. 2008 Dec;36(1):55-61.